Help us create fresh starts and rebuild family ties - join us for our 10th annual Transformation Breakfast and learn how YOU can make a difference! 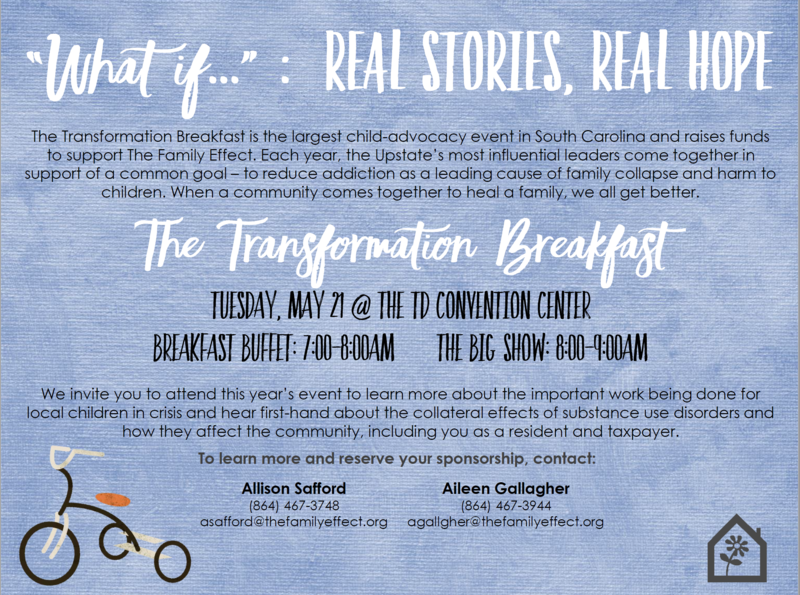 The Transformation Breakfast is the largest child-advocacy event in South Carolina and raises funds to support The Family Effect. Each year, the Upstate's most influential leaders come together in support of a common goal - to reduce addiction as a leading cause of family collapse and harm to children. We invite you to join more than 1,000 community leaders sponsoring this year's event. Learn more about the important work being done for local children in crisis and hear first-hand about the collateral effects of substance use disorders. To sponsor our 2019 Transformation Breakfast and the exclusive perks available to our supporters, check out our 2019 Sponsorship Packet. Thank you for being such a strong, caring community who is truly making an impact in the lives of children in the Upstate. If you have any questions or you're ready to sponsor the event, call Allison Safford at (864) 467-3748 or Aileen Gallagher at (864) 467-3704. Find more information on our Eventbrite page. 84 cents of every dollar will be used to directly treat young children and families suffering from the effects of addiction in the home.